Thermal Graphic Printer 200+ :: Coda Octopus Products Ltd.
With an excellent worldwide track record as robust and reliable thermal recorders, Coda Octopus printers are in used in a wide range of applications from Military ASW to geophysical and hydrographic survey. The Octopus 200+ 20-inch thermal printer shares its core design with the successful 120+ thermal printer. 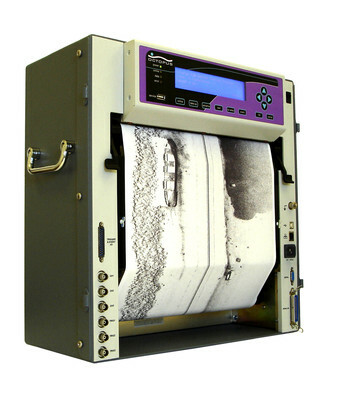 Producing high quality continuous images onto thermal paper or film, it is up to five times faster than other models and is ideal for hard copy output of military or geophysical data. 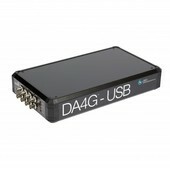 With a wide range of interface options including Ethernet, USB, and parallel (Centronics) and compatible with most PC based acquisition systems, the Octopus 200+ is easily interfaced with commonly used data sources. 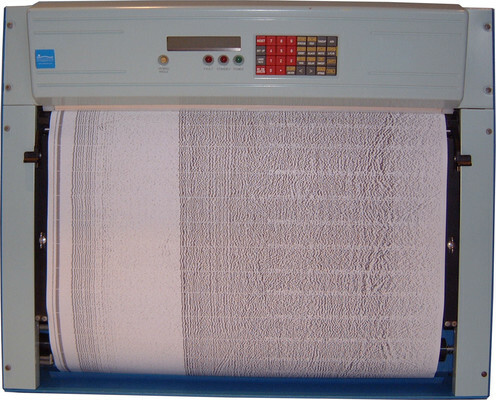 A unique three-channel analog input capability has fully independent channel settings, enabling simultaneous display of geophysical data such as seismic and side-scan. Print resolution of 200 dpi at up to 256 grey levels, with a print width of 4096 pixels, means that data can be printed at very high resolutions. With greater print width than many other similar models, the Octopus 200+ is able to print three channels without compromising resolution. Fully interchangeable with the original Octopus 200 printer, a selection of upgrade or trade-in options is available to current owners.